When you become a parent, you also become a teacher. Some things we teach our children are useful – letters, numbers, how to say “Mama” and “Dada,” and the fact that diving headfirst down the stairs causes serious “owies.” Other things aren’t quite so important. Why exactly do we think our kids need to know the sound every single farm animal makes anyway? But there’s one thing we parents should teach our kids about that we rarely do: the brain. Fortunately, our newest article on the PBS Parents website makes teaching your children about the brain simple, effective and fun! If you think the other things we write are pretty smart – like this easy-to-subscribe-to website, or our easy-to-purchase (in both the U.S. and now India!) 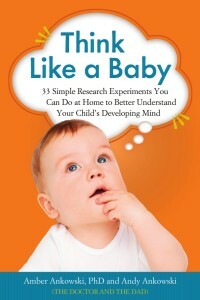 book Think Like a Baby – then you’re sure to think this article is pure genius! Yep. Don’t think the same trick works on grandparents, unfortunately.